That is, assuming HTT can build its track in time for its self-imposed deadline. Hyperloop Transportation Technologies has unveiled its vision for a passenger capsule that will ferry people around the globe. The company has pulled the dust sheets from its first pod, called Quintero One, at Puerto de Santa Maria, the home of Spanish manufacturing partner Carbures / Airtificial. Now that the vehicle has been shown to the world, it'll be sent to HTT's European HQ in France for "additional assembly and integration." The company expects that Quintero One will be pressed into service in a fully working commercial system at some point in the future. We won't know much about how the pod will work, but some of the specifications the company has revealed shine a light onto its thinking. For instance, Quintero One measures 32 meters (105 feet) long, with the passenger cabin measuring 15 meters (50 feet). We can assume that the propulsion, life support and other systems are buried both in the nose cone and behind the smaller passenger compartment. We don't know how many people HTT expects to seat in every pod, but its dimensions roughly correspond to a New York Subway car. A 15.6-meter R188 Car has a maximum capacity of 188, which includes a significant number of standing passengers. Some back-of-the-envelope math suggests that a fully-seated pod could comfortably carry around 80 people. The company says that it's worth thinking about the pod as an "airplane without wings," which makes plenty of sense given the aerospace engineering necessary to make it work. Both HTT and Airtificial (a partnership between aerospace companies Carbures and Inypsa) say that the pod is a landmark piece of engineering. Airtificial co-founder Rafael Contreras added that, because the pod uses an unprecedented amount of carbon fiber and composites its in its construction, it's the "safest transportation vehicle in the world." If you're wondering, Quintero is a Spanish surname that means the "fifth," and is associated with farming as well as being the name of a cigar brand. It might just be an act of whimsy by the pod's engineers, or a subtle nod to the fact that Elon Musk called Hyperloop a "fifth" mode of transportation way back when. 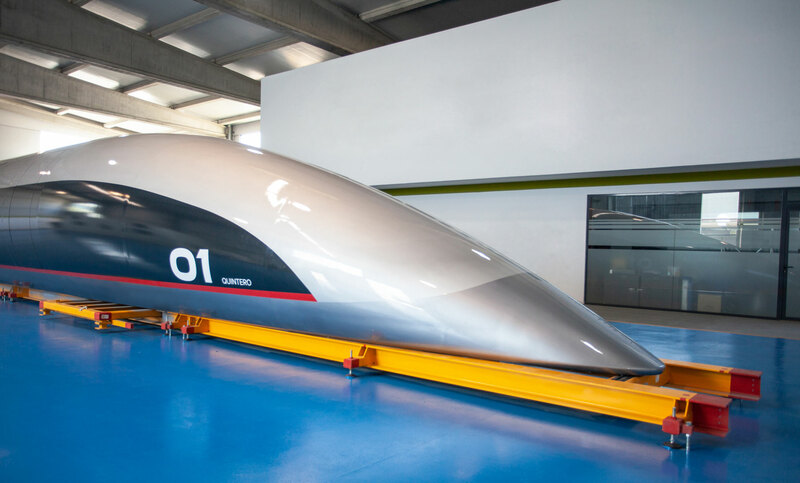 HTT believes that the capsule will be ready to convey passengers before the end of 2019, and committed to building a test track at its French facility. The company has also built an insurance and certification framework that, it claims, will enable it to roll out its technology across the globe without interference or worry.